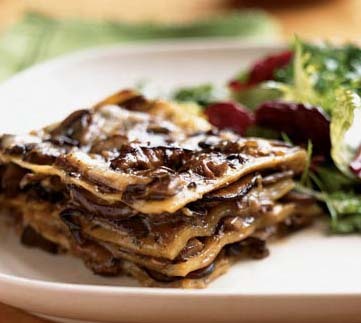 The rich Béchamel sauce combined with mushrooms and tomatoes makes for a very different type of lasagna and it’s absolutely delicious! I once took this to a group where we each brought a dish to share and it disappeared. Heat the oil and sauté onion until transparent. Add the chopped tomatoes and cook for 6-8 minutes, stirring often. Season with salt and pepper and set aside. Heat 2 Tbsp. butter in skillet and sauté mushrooms. Cook just until they exude juices. Add garlic and lemon juice and season with salt and pepper. Cook until liquids have almost evaporated and mushrooms are starting to brown. Set aside. Preheat oven to 400 degrees. Assemble as follows: 1st layer on bottom of large buttered baking dish - Béchamel sauce, pasta, thin layer of mushrooms, sauce, Parmesan cheese. 2nd layer should be pasta, thin layer of tomatoes, sauce, Parmesan cheese. Repeat the alternating layers, ending with a layer of pasta coated with béchamel. Do not make more than 6 layers of pasta. Sprinkle with cheese and dot with butter. Bake for 20 minutes. Remove from pan and allow to stand for 5 minutes before serving. In a medium heavy saucepan, melt butter over low heat. When butter starts to foam, add the flour all at once, mixing well with a wooden spoon. Cook over low heat approx 6-7 minutes until the mixture turns a light golden sandy color. Remove pan from heat and let stand, up to 15 minutes. Meanwhile, in a medium saucepan, scald milk (heating it until just below boiling point). Return saucepan with roux to medium-low heat. Add all of the scalded milk at once (to avoid the formation of lumps). Simmer, stirring gently with a wire whisk or wooden spoon. Add studded onion and bay leaf. Cook, stirring, over low heat, 15 to 20 minutes, until smooth and thickened. Strain sauce through fine-mesh strainer. Add salt, white pepper and nutmeg to taste. This sauce is a bit thinner than one used for topping vegetables as it will thicken up while cooking with the lasagna. This is something I will make for ME, ME, ME, in mind 😉 and the rest will also enjoy. Wow, I cannot believe I wrote that out loud, Barb. We’re having the usual hot weather before it cools down for fall, so cooking lightly this week. I’ll even brave going to Whole Foods to get mushrooms. I love this dish and am grateful for the reminder…now I need it. And this time with tomatoes and a new photo. It is so good Annapet.